MonoUE | Mono for Unreal Engine is a plugin for Unreal Engine that allows writing gameplay code with C# and F#. Mono for Unreal Engine is a plugin for Unreal Engine that allows writing gameplay code with C# and F#. Fully integrated with the Unreal object system and Unreal Editor. 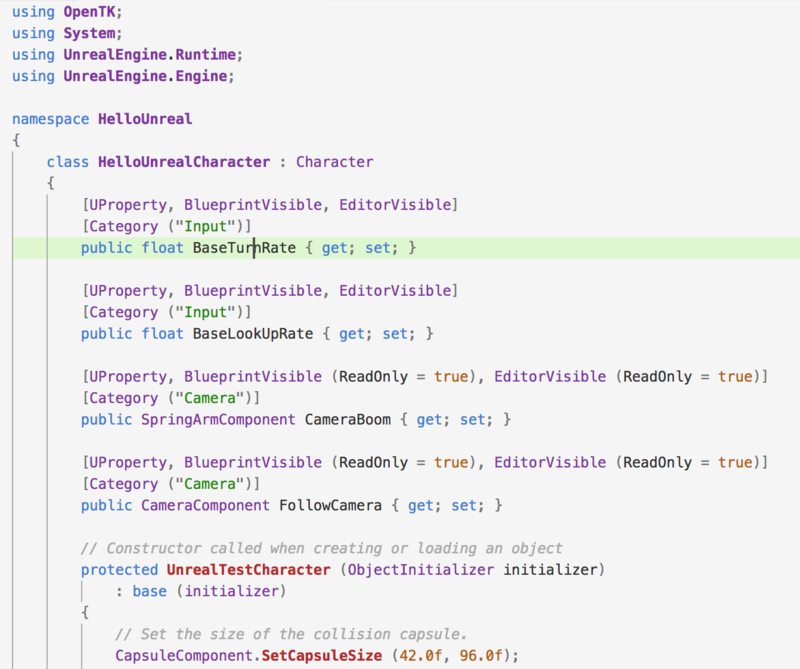 C# bindings are generated automatically for all Blueprint-accessible types and members. Objects and functions defined from C# can subclass types defined in C++, and can be used from Blueprint and from the Unreal Editor. Runs on Windows and Mac. Feature requests and and bugs are tracked using GitHub Issues. The plugin is currently available only as source, as it requires a patched build of the engine. You will need source access to Unreal Engine on GitHub to get access to the MonoUE fork. Follow the instructions in the Engine/Plugins/MonoUE/README.md. The plugin has been developed with the support of Microsoft, but is currently a personal side project of several Microsoft employees. It is not officially supported by either Microsoft or Epic. It is being made freely available as source to all Unreal Engine licensees in the hope that the community considers it useful and participates in its development. This code is provided by Microsoft “as is” with no warranty. For details, see LICENSE.md in the plugin directory. For questions and discussion, please use the mono-ue mailing list or the Gitter chat room. The primary contact for the project is Mikayla Hutchinson (@mjhutchinson).